BMW will launch Protonic Frozen Black and Yellow special editions of the i8 this year. This year’s Geneva Motor Show promises a host of exciting new car reveals from Pagani, Porsche and Alpine. Now BMW has shown us what we can expect at the show from the German manufacturer. 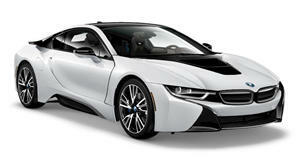 A special car like the i8 hybrid rightly deserves some special editions. As such, BMW has been rolling out a range of special “Protonic” i8 models with unique color schemes and bespoke interior styling: so far we’ve had Protonic Red, Blue and Silver editions. But this latest i8 special edition is arguably the best-looking yet. Dubbed the i8 Protonic Frozen Black Edition, this latest special edition will be built in a limited run and will go on sale in April. Complementing the Frozen Black paint finish are grey metallic accents to give the i8 a refreshingly menacing look compared to some of the standard factory colors. Inside, you’ll find bright yellow contrast stitching on the seats and center console, along with grey seat belts and Protonic Frozen Black lettering on the door sills. If you want something even more ‘in your face’ BMW is releasing a Protonic Frozen Yellow edition of the i8 later this year, which will sport the same interior as the Frozen Black but with, you guessed it, a bright yellow exterior color scheme. These special editions are purely cosmetic: you’ll still get the same 1.5-liter three-cylinder engine with an electric motor that produces a combined 357 horsepower. BMW will also debut the new luxurious 5-Series Touring at Geneva due to go on sale in June, which will be just as technologically advanced as the new 5-Series sedan, but with 570 liters of storage capacity in the rear for added practicality. It’s also 100 kg lighter than the previous model. In addition, BMW willbe showing off the facelifted 4-Series for the first time, featuring new front and rear aprons, sportier headlights and taillights, and improved handling thanks to its stiffer suspension.